That's what I keep telling myself, but I'm not sure I 100% believe it. 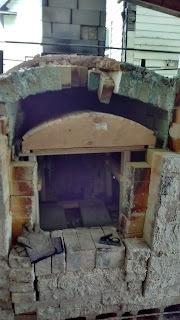 Like a lot of repairs, the kiln has to get worse before it can get better, freaking me out a little bit every step of the way. I had to (of course, but still) remove some of the brick around the doorway in order that the arch form fit in, and though I was pretty careful to stack the brick exactly as they were in the doorway part of me wonders if I will be able to put them back correctly. Half-assedness is so ingrained in my nature that even when I try to be meticulous a fair amount of half-assery slips in. 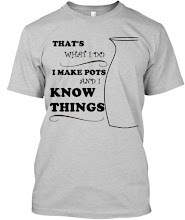 It doesn't help that I am making this up as I go along. 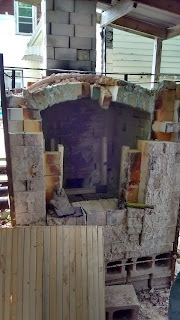 The Kiln Book covers building an arch but not repairing one without taking the whole thing down & starting again. My consolation is, if this doesn't work, taking it down & starting again is always an option. It's clearer than ever how much the walls have spread. 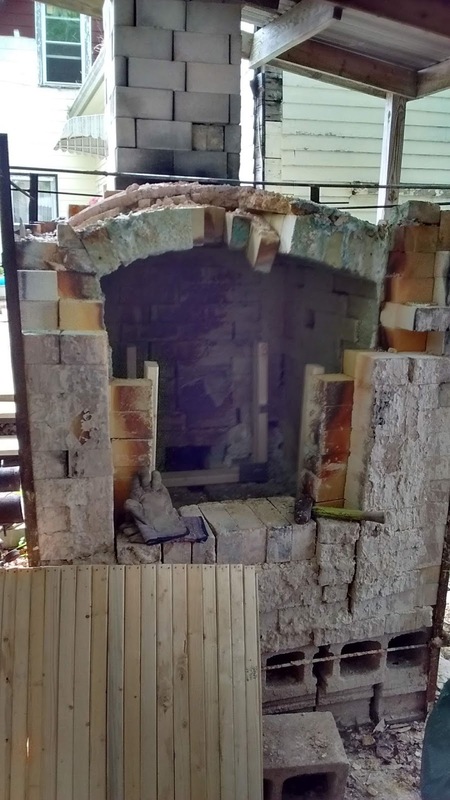 Note to self & all other kiln builders: next time, make holes for two tie rods: when one breaks, the other will hold long enough to replace the broken one. Just think, for the 5 minutes it would have taken to drill 2 additional holes I could have avoided all this work, if not forever, at least for several years. I've now completed the easy part...now to figure out how to jack up the form under the brick. It may be that my plan to support the center, just enough to pop in the missing brick, will need revisiting; possibly there is no way to do this without pushing up the whole arch. Right now the plan is to use a pair of jack posts to hold the form in place while I do the repair. Will let you know how it goes. You are a courageous woman! Ha! Not so much. Just too cheap to hire it done. I am with Smartcat... you are brave! 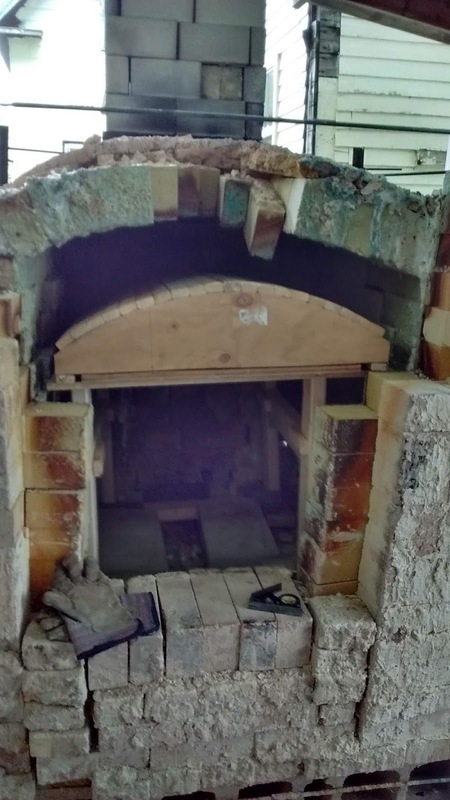 I have always thought the scariest part of kiln building is removing the arch form. Thanks! Wait'll you see the next steps. Almost there now!